My mom is famous for her stuffing–every year she’s asked to make the pies (she was a caterer for 20 years who specialized in dessert so pies are her forte) and the stuffing, if nothing else. When I called her and asked for the recipe she paused and said, “well…now I’ve actually got to think it out and write it down.” These kinds of recipes are my favorite–the recipes that are passed from mother to daughter, person to person and are so ingrained in tradition that having them written down on a piece of paper is no longer necessary. Thankfully she did sit down and write out the recipe so now I have it to pass onto others. 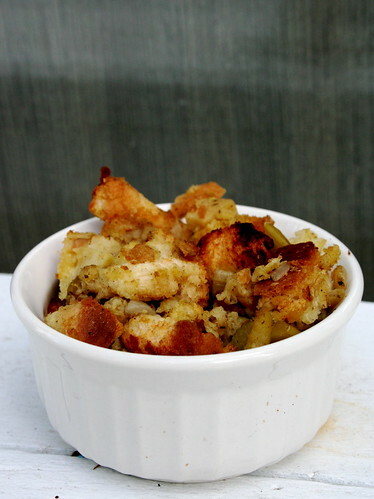 The key to the recipe is setting aside enough time to let the stuffing sit in the fridge for several hours to all day. The longer it sits the more the flavor seeps into the bread, giving it the savory, garlicky, sweet taste it has. Ideally I use half a loaf of white bread and half a loaf of wheat bread to add even more flavor. Be sure to buy good quality bread–mine comes from a local bakery. Don’t use the squishy white stuff sold in grocery stores. It just won’t hold up nicely. Pre-heat the oven to 225 degrees Fahrenheit. Place bread slices on the oven racks and dry for 30 minutes. 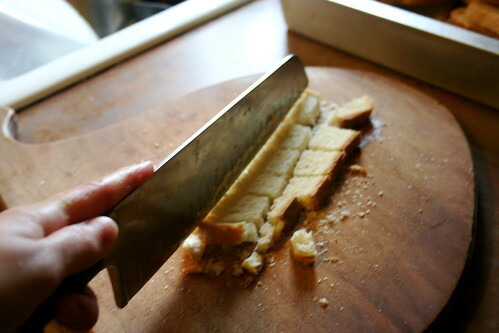 Make sure the slices are dried but not browned. 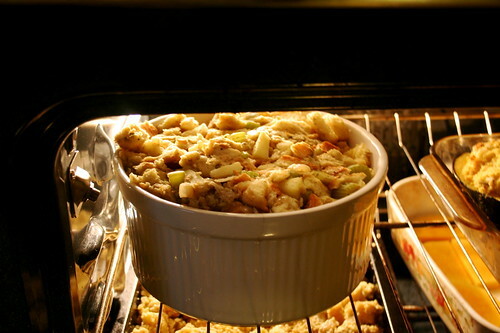 Remove from oven and cut into ½ inch cubes. Place in a large mixing bowl. 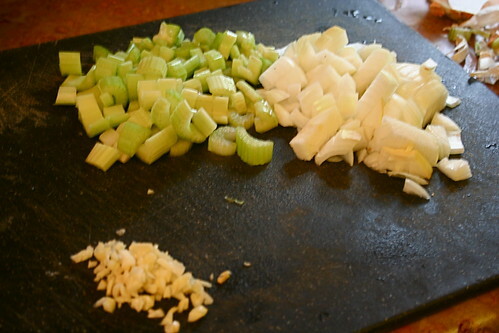 Meanwhile, chop the onion and celery into small pieces. Mince the garlic. 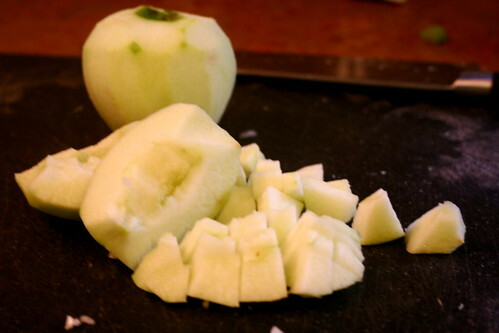 Peel and core the apples, dice into 1/4 inch dice. Heat a large skillet over medium high heat until hot. Add 1 tbsp olive oil to coat bottom. 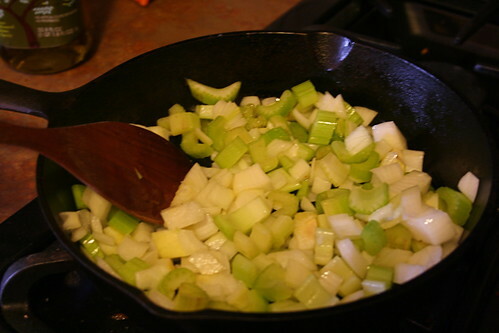 Add the chopped onion and celery to skillet; sauté until softened. Stir in the thyme, sage, garlic and cook about 30 seconds. Add the onions, celery, garlic, and spices to the bread cubes. 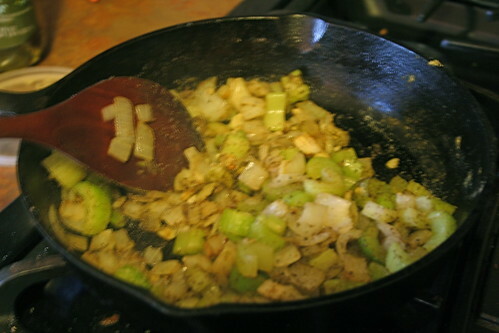 Replace the skillet on the burner (still on medium heat). Add 1 more tbsp of olive oil. 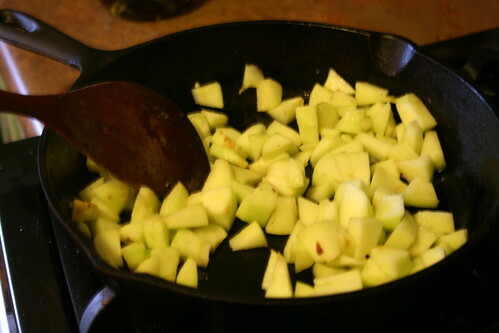 Add the apples, saute for 5 minutes until softened. 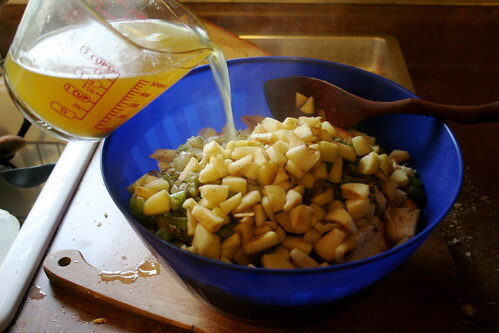 Add the apples to the bread cubes. 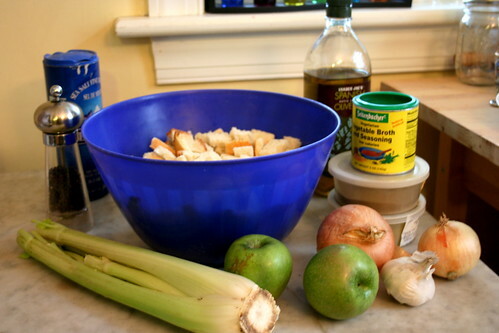 Pour the vegetable broth over the bread cubes and apple-onion mixture. 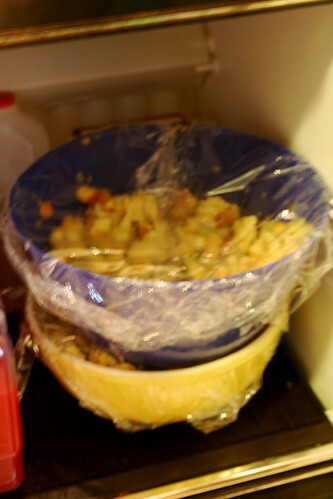 Stir to combine, cover with plastic wrap and refrigerate to blend the flavors, at least 1 hour or up to 4 hours. Adjust oven rack to lower-middle position. Oil with remaining tbsp of olive oil a 9 x 13 pan or two 9 inch square pans (or large round casserole dish). Preheat oven to 400 degrees. 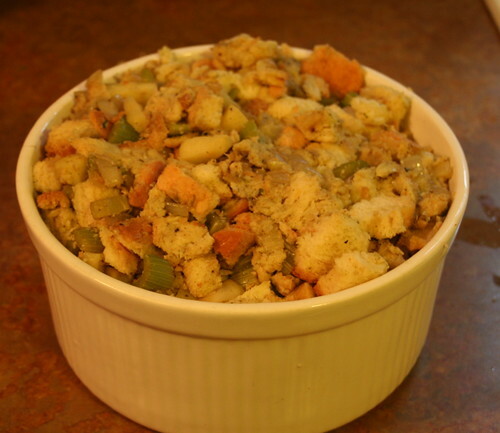 Transfer stuffing to dish; pour any liquid that has accumulated in the bottom of the bowl over the stuffing and if necessary gently press the stuffing with a spatula to fit in into the baking dish.